Every summer , it is festival season where everyone lives in tents for 5 days, enjoying company, living up the high life while watching live bands,with a beer permanently stuck on their right hand and facing the inevitable rain that will probably happen at some point of the festival. This year is no different , except this time, there’s a flurry of emotions spreading across the fan bases of bands that are coming back from hiatuses or promoting new albums, and bands that people get to see for the first time. Here’s a list of festivals that we put together of where you should go to! For every festival, there is always one that stands out in the UK , the most. Every year, the line up becomes more impressive, and this time, when we found out about the line up, we couldn’t stop giggling about it especially since one of the writers on this magazine will be going to the festival and will be talking about it soon! It was voted and won an award for best festival at the NME 2013 Awards. 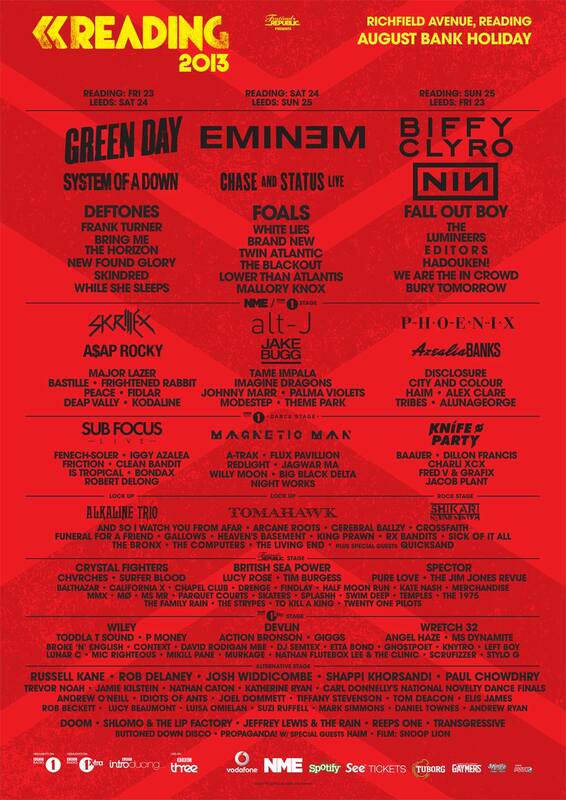 With Green day, Eminem and Biffy Clyro headlining the festival, who wouldn’t want to miss out on that. And bands such as Fall out boy coming back from the dead, it is bound to be a festival where nostalgia is full ahead. 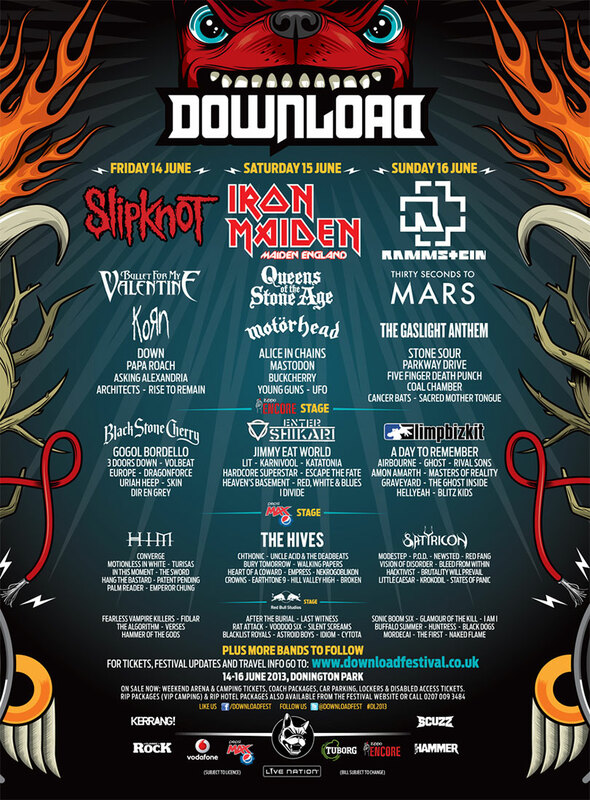 Download is back with a line up that will excite anyone in the rock/metal community. Slipknot come back from a 3 year hiatus to headline the festival, and if it is anything like what happened at Sonisphere 2011 and Download 2009, it will be just as emotional with rawness . This is their second time headlining since Download 2009. Iron Maiden and Rammstein are also headlining. Each band brings along fans to the event , and new fans that to Download for the first time. Get ready for sweaty men in mosh pits, and amped up guitars raged up to the highest level. This is where the celebration of rock and metal happens. A majorly heavier festival than Download, this is where fans of bands of headliners King Diamond, Lamb of god and Slayer will be at. With the recent death of Jeff Hanneman of Slayer , there will be a definite somber atmosphere around the festival, and no doubt his life will be respected and the thousands of tributes that will happen at this festival. Bloodstock has attracted thousands of metal fans, and has had success every year since it’s start in 2001. This year, the line up brings more metal to the table and with more head banging moments. Despite being a new festival in London, it doesn’t stop them bringing big names to the festival. It is a two week festival catered for of course, Londoners as it is not a camping festival and it is held in Hyde Park. Bon Jovi who have a new album out, will be headlining one of the dates along with The Rolling stones. 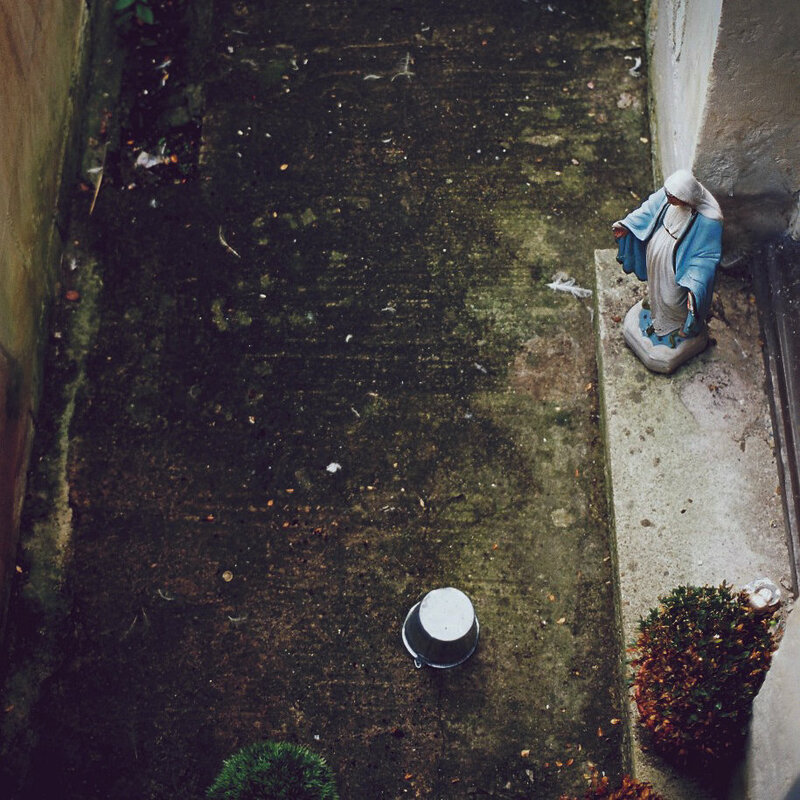 London , although not a city for camping , it always attracts big artists and bands to play. 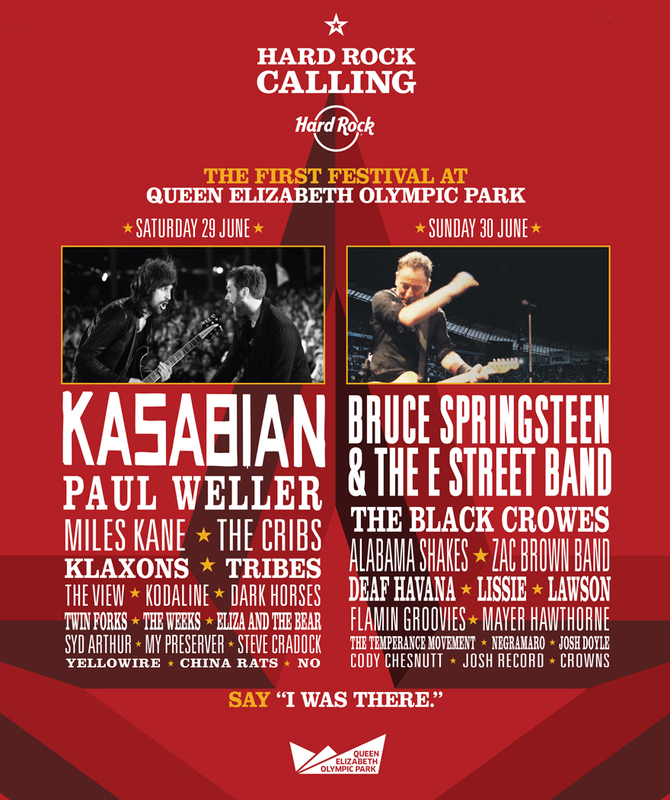 Another festival in London, filled with rock bands , including Kasabian and Bruce Springsteen headlining over the two days. It will be held at the new venue , Queen Elizabeth Olympic Park where it held the London Olympics last year. Wireless festival, hosted in London has got the biggest names in pop music performing , these acts include Justin Timberlake, Jay Z, Emeli Sandez and John Legend. Timberlake with a new album under his sleeve, it will bound to excite the crowd. Independent festival, Leefest started in 2006, hosted in the outskirts of London, intimate and displaying creativity. This year there are bands such as Noisettes in the line up, and the chance of checking out many up and coming new bands. 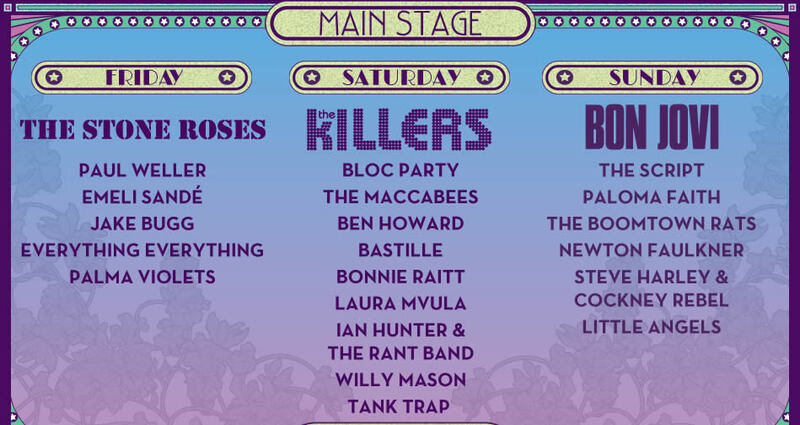 Leefest has definitely gives the ability to promote these bands to bigger things in the music industry. This festival collaborates not only with music but also with visual artists and performance artists, so there is something for everyone. With The Stone Roses, The Killers and Bon Jovi headling at Isle of Wight festival, there is no doubt that the festival is getting bigger and becoming more popular in terms of festivals. From the beginnings of 2002, Isle of wight is coming out from its hidings and showing everyone the chance to party. 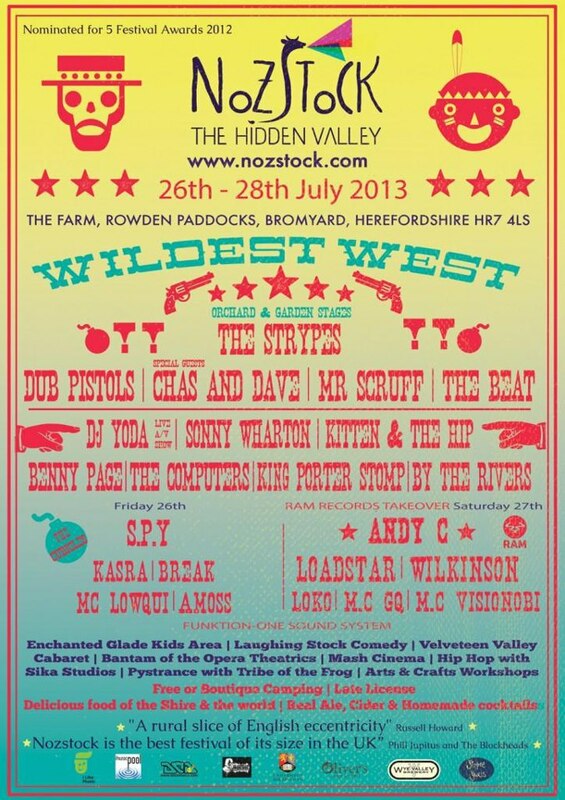 Unknown festivals are always great, hidden in the rural parts of Herfordshire is Nozstock festival. Secret garden party is a festival that is different from a lot of festivals, each year they have a theme for the event and based on that theme, they work around it. This year’s theme is “Superstition”. Bands and artists like Regina Spektor , modestep and hadouken will be playing as part of the line up. 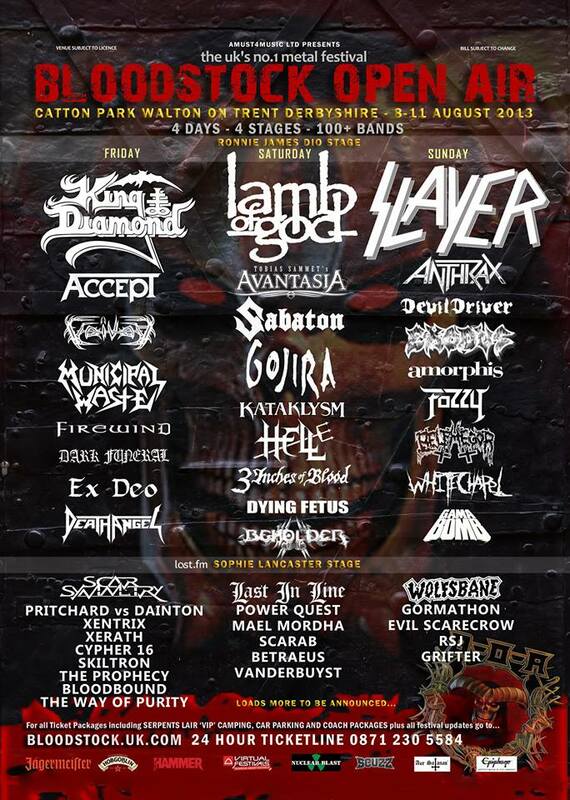 A metal festival that is growing behind Download , it is hidden away , but the line up is big especially with Killswitch engage being part of the line up. A probable post Download chill out gig!